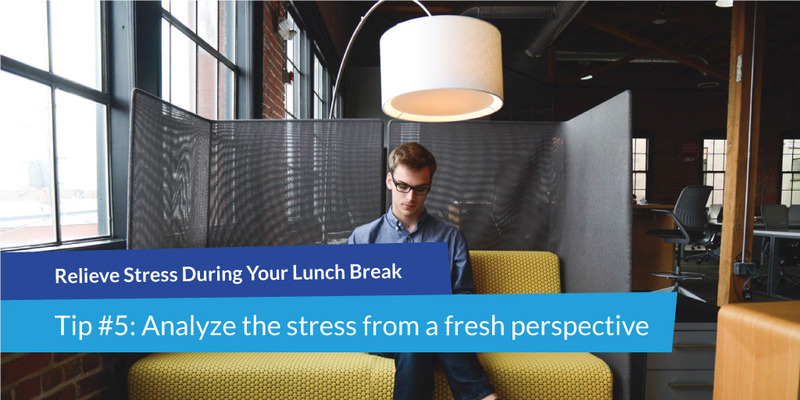 5 Easy Ways to Relieve Stress During Your Lunch Break - DaysPlan, Inc. It happens to the best of us. You experience a stressful situation at work–maybe your boss yelled at you for a mistake or your coworkers asked for one too many favors. Then those stressful events start to add up until your head feels more like a nuclear bomb. With no method to relieve stress, many employees end up burnt out eventually. Even those who feel happy and satisfied in their job have days when the stress becomes overwhelming. In fact, a study by the American Psychological Association in 2011 reported that 20% of the employed adult participants said that their average level of daily stress from work is an 8, 9, or 10 on a 10-point scale. That’s a pretty high level of stress to deal with. Having high levels of stress in the workplace on a regular basis may indicate that you need to reconsider your job choice However, experiencing a stressful day every now and then is normal and can be managed. 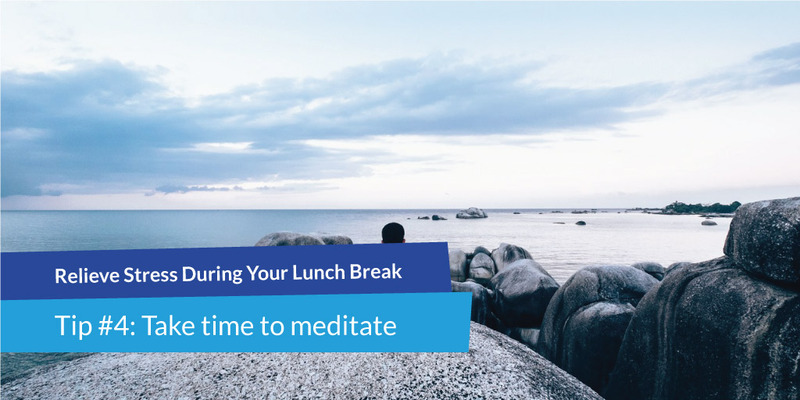 Although there are lots of ways to relieve stress, these strategies are easy to implement and can give you some major relief during your thirty-minute to one-hour lunch break. In many office cultures, it’s common for employees to sit at their desk and even continue working during their lunch break. While your work environment may make you feel pressured to stick with this routine, it’s simply not healthy for you or your mind. As humans, we naturally associate emotions with our environment. That’s why we can grow to hate places that we’ve had a bad experience in or around. The same thing happens when you go through a stressful situation at work. You may not realize it, but continuously being in the environment where the stress occurred causes you to hold on to that stress even more. 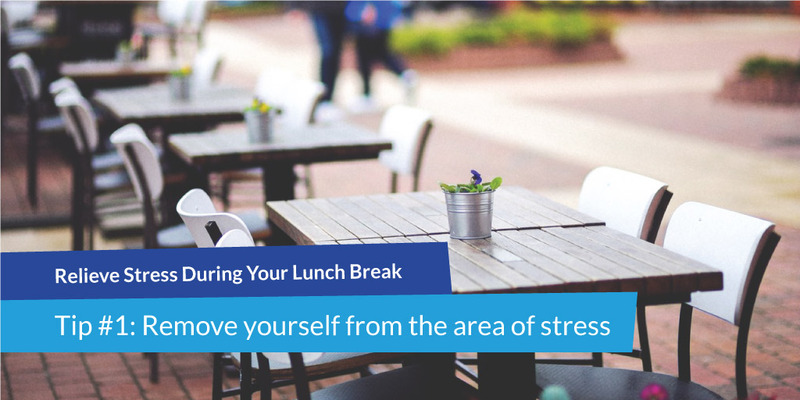 If you’re strapped for time or feel really uncomfortable leaving the office altogether, even going to your office’s eating area can help. This is an incredibly easy way to separate yourself from things or people in your immediate work area that may be stressing you out. 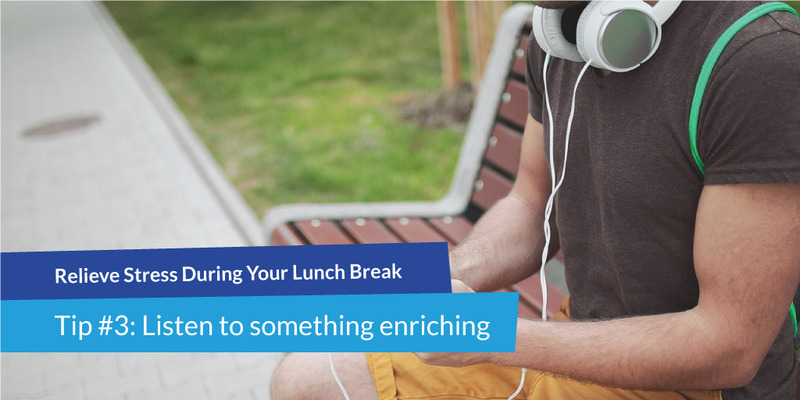 An overflowing inbox or a cubicle neighbor that only likes to talk on speaker phone doesn’t have to follow you to lunch. 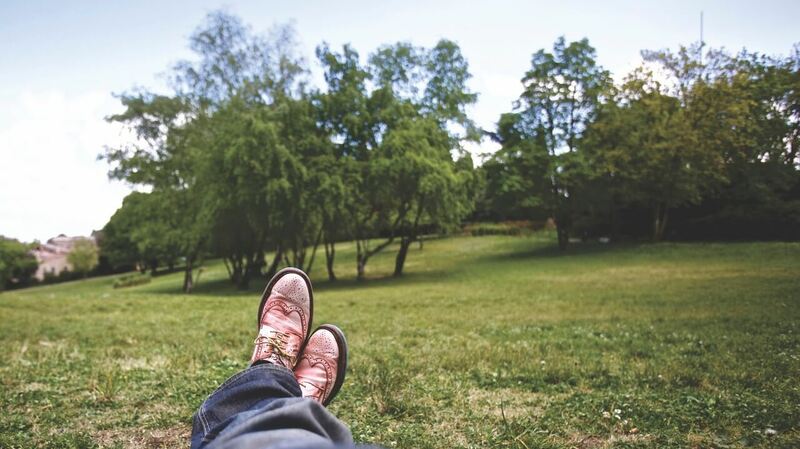 If you can get out of the office, one of the best things you can do for yourself is to get some fresh air and vitamin D.
“I try to be mindful of my surroundings, noticing the trees against the sky, grackle on a lawn, the patterns of clouds. 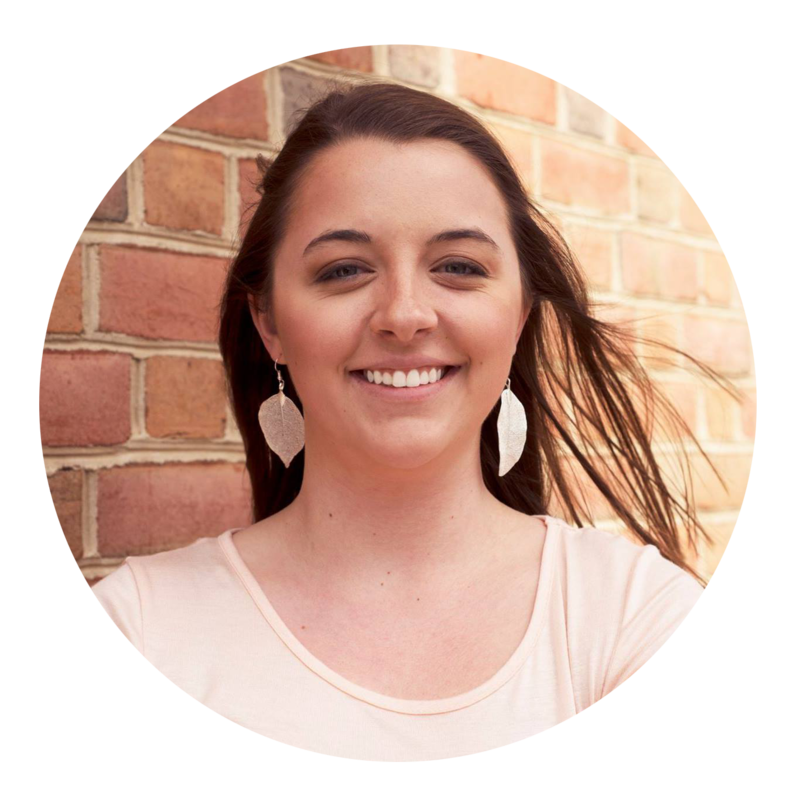 It just takes the edge off,” said Sophia Dembling, a blogger for Psychology Today. While you’re outside, try to put your phone away so your eyes can get a break from looking at a screen. This will also allow your mind to unwind better. The weather may not always be sunny and perfect where you live. Another way to get a break from the office is to go to a restaurant that has more of a relaxing atmosphere. Cafe-style restaurants are often a great spot to have lunch. They have a calmer environment and are better suited for quick meals. Whether you bring your lunch from home or go out to a restaurant, it’s important to eat something healthy and nourishing. One of the ways to relieve stress is by simply taking care of yourself. Make sure that you are fueling your body with food that will help you remain mentally alert and fulfilled for the rest of the work day. When you’re eating sweet or greasy foods for lunch, you tend to notice a difference in your mental behavior for the rest of the day. Since foods like this can often spike your blood sugar levels, you” end up having a “crash” a few hours later. And we all know that when we are hungry (or should I say hangry), we do not have the mental energy to address stress in our life in the proper way. In fact, feeling this way can often make our stressors seem even heavier on our shoulders. 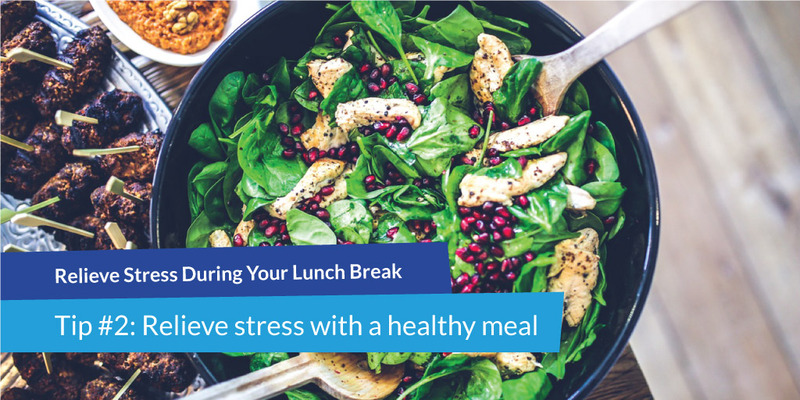 Incorporate nutritious and filling foods–like lean meat, green vegetables, and fruit–into your lunch meal. Then you’ll feel even more fueled to head back to work with a positive attitude. Sometimes, if the stressors at work are severe enough, simply leaving the office environment is not enough to turn off the negative chatter going on inside your mind. That’s why it’s helpful to listen to something that can help redirect your attention towards positive thoughts and relieve stress that is controlling your mind. If you enjoy listening to podcasts, here are a few that are uplifting and/or reflective. All of these podcasts are rooted in positivity and inspiration. So listening to an episode during your lunch break can really change your outlook on the current situation. You can listen to any of these podcasts with an app like Overcast for iPhone or Google Play Music for Android. If you aren’t a fan of podcasts, I would suggest listening to some relaxing and uplifting music. Music of this nature is proven to help relieve stress and is a technique that many psychologists swear by. Whether you choose to listen to podcasts or music, the goal is to change the space that your mind is in. Instead of feeling tense, stressed, and argumentative, we want to feel calm, relieved and uplifted. Have you ever meditated before? If you have, then you probably already know how much of a mood booster it can be. If you’ve yet to get on the meditation bandwagon, you might be thinking it isn’t right for you. I used to feel the same way. I was hesitant to try meditation because it seemed silly to sit with my eyes closed for an extended amount of time. However, I finally caved and gave it a try after hearing about how effectively it can relieve stress. If you still don’t think meditation is right for you, I wanna invite you just to try it once. For a beginner, it’s helpful to listen to a guided meditation. A guided meditation in when a person’s voice will explain how to get in the right frame of mind for the particular meditation, what to focus on and when, and what to do if you find your mind straying (which always seems to happen!). You can find guided meditation recordings from phone apps like Calm or Headspace. These apps usually have a few recordings available to listen to for free. They will also usually list the length of the recording, so you can find a suitable one to fit in during your lunch break. If you decide you want access to more recordings, you can typically buy the premium version of the app or sign up for a monthly subscription. This might be a good option for you if you feel like you need to relieve stress on a regular basis. Once you’ve completed some of the above activities, you’ll likely find that your mind is in a much more positive and thoughtful space. This is the perfect time to take a new look at the problem that was stressing you out at work. First, determine what the source of the stress is. Is the stress caused by something in your control? For example, you may take on too many side projects at work because you have a hard time saying no. Or perhaps your inbox is piling up because you need a better system for planning your day ahead of time. If you determine that the stress is ultimately due to your own actions, then you now know that you have all of the power to fix the situation. Think about what changes you can make, in and outside of work, to mitigate that stressor. So what if the stress is not caused by your own doing? Well, these situations are a little trickier to solve but are still doable. If you are having trouble with a coworker or your boss, consider scheduling a one-on-one meeting with them to discuss your issues. Sometimes just initiating the conversation can make a world of difference. Once you have determined an action plan for addressing your stressful situation, start making those steps to solve the problem. – Susan Krauss Whitbourne, Ph.D. I hope that these tips will help you overcome the stress you face at work in a healthy way. Doing these activities on a consistent basis will not only relieve your stress but will also help you be better mentally prepared for challenges to come. What stress-relieving activities do you like to incorporate during your breaks? Share your favorite strategies in the comments below! 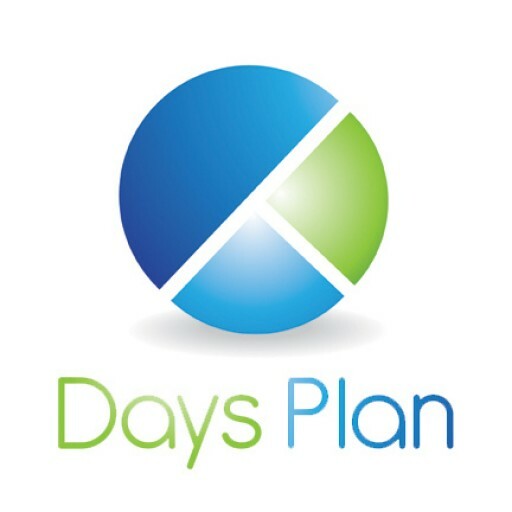 Digital Marketing Associate at DaysPlan. I’m passionate how about marketing, design, and psychology work together. Supreme Netflix binge-watcher and dog lover. You can usually find me with my golden retriever, Mavy.